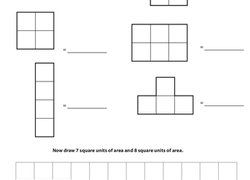 When your students are growing familiar with 2D shapes, they can use these area worksheets to help them understand how to calculate the area of 2D shapes. If they are ready to move on to more complex topics like calculating the volume of a 3D object, let your students gain a deeper understanding of the characteristics of 3D shapes with 3d shapes worksheets. In this helpful worksheet, your third-grader will learn how to count square units to find the total area of a shape. 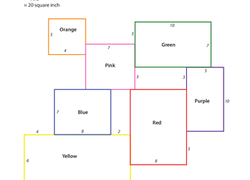 Build your students’ foundational understanding of geometry as they determine the area of shapes by counting the unit squares. Introduce your students to the idea of geometric area by relating it to addition and multiplication. With this worksheet, your students will find the area of rectangles in the context of real world problems. 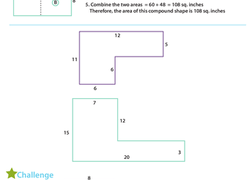 Get a clear view of geometry with this worksheet! practise calculating surface area by finding the area of the square windows. Use this resource with your students to celebrate March Madness as they find the area of different sized basketball courts. Can your fourth grader help Grandma make a quilt? They'll get valuable practise working with basic geometry. 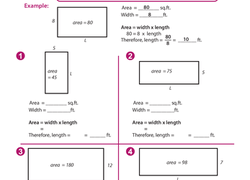 Introduce your child to algebra with this year 6 worksheet in which your child will use algebraic equations to find the missing length of each rectangle. 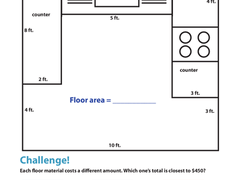 In this year 5 maths worksheet, your child will find the area of the kitchen floor, then calculate which kind of flooring is within budget.